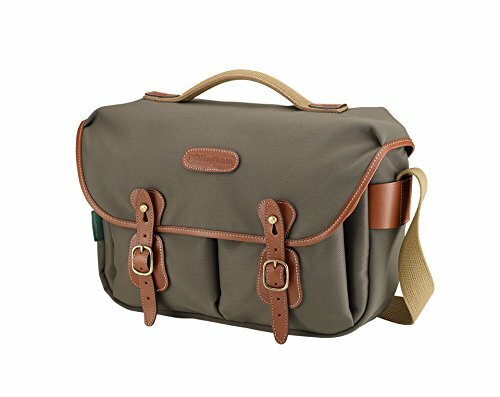 Billingham Hadley Pro, Small SLR Camera System Shoulder Bag, Sage with Tan Leather Trim. The back zip is protected from the weather by a waterproof flap with free ends to make opening and closing easy-peasy. The two front pockets have generous bellows and seperate flaps while the Main flap has the Billingham Quick Release System and adjustable straps for increased loading. The Hadley Pro insert is removeable, which makes the bag very flexible. The gap between the insert and the bag can be used to store papers. Strong web handle is stitched and rivetted to the main flap. With the shoulder sling tucked inside the bag you have a handsome briefcase. The Hadley Pro insert being located in place with the press stud. If you have any questions about this product by Billingham, contact us by completing and submitting the form below. If you are looking for a specif part number, please include it with your message.